I couldn't pull this sweet alyssum when I weeded today. As visions of Julia Child danced through my head, I planted shallots and garlic in the vegetable garden today. This was the perfect day for it. We finally got our first frost and our first freeze on Saturday morning. Hallelujah and glory-be. I was ready for it. I'm used to the first frost coming around October 10th and that's the signal to start garden clean up. Forget that I don't ever really start garden clean up in earnest until November. Just accept that I needed the first frost to remind me to at least start planning to clean up the garden messes. Really, everyone needs a little time and some early signs of the end of the growing season, like frost, to start thinking about garden clean up before they actually do it. We need time to process that it is truly the end of the growing season again. Now I feel all behind. But I'll pull myself up by my gardening boots and get on with it now that it is November and we've had frost. So today, under clear skies with temps in the 40's, I cleaned up just one raised bed in the veg garden, the one where I planted shallots and garlic. Did you know we should plant garlic and shallots in the fall? Sure you did. 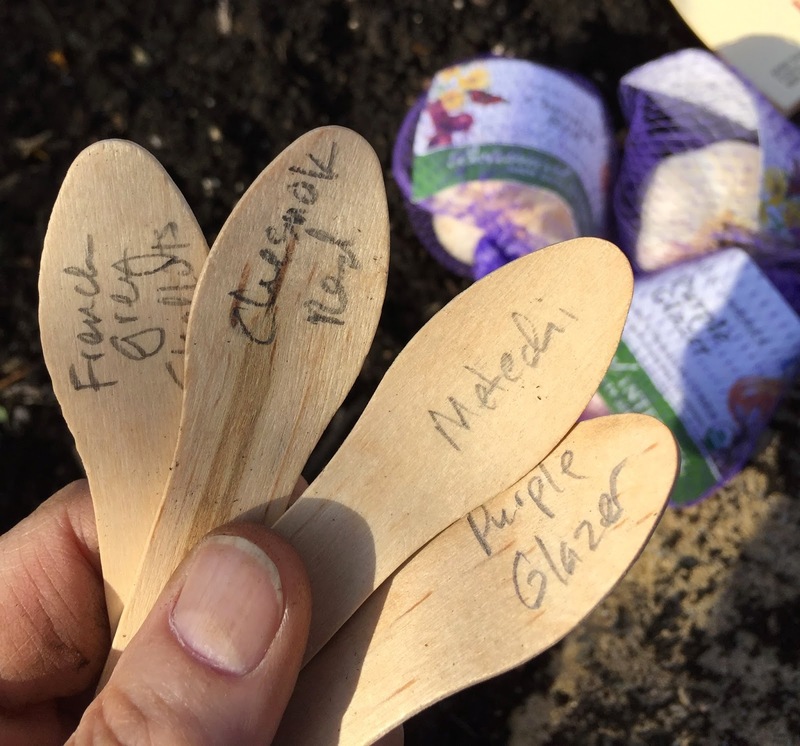 This year, I planted French Grey Shallots and three kinds of garlic - 'Chesnok Red', 'Metechi' and 'Purple Glazer". These are all hard-neck garlic varieties, which do better in my climate than the soft neck varieties. I bought the garlic bulbs from Botanical Interests because they sell them by the bulb instead of the pound. I truly do not need to plant garlic by the pound. Same with shallots. 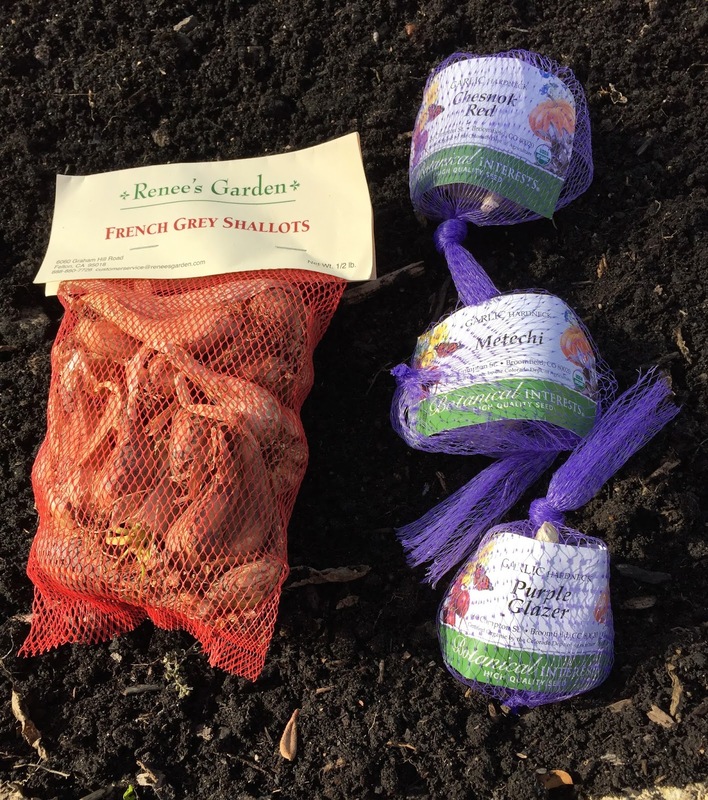 Just one little bag from Renee's Gardens is enough for my garden. 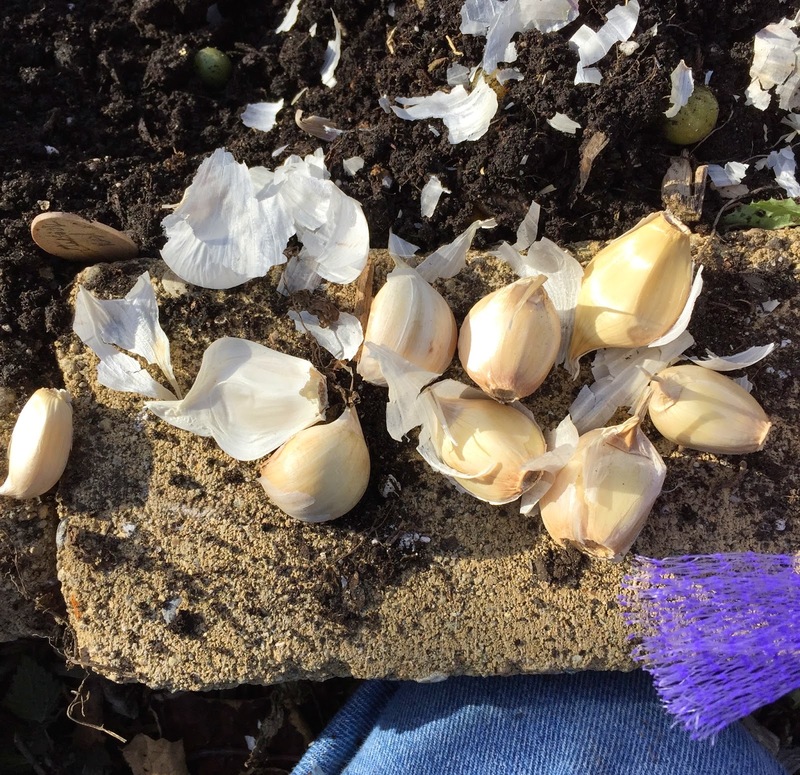 To plant garlic, you first need to separate the cloves from the bulb. Each clove will grow into a nice new bulb of garlic. The number of cloves per bulb varies, as I found out. The 'Metechi' bulb was nice and big but was made up of only five or six cloves, which was about half a row. What about the rest of the row? Leave it blank? It wouldn't look right in the spring. I don't usually suggest people plant garlic cloves from garlic bulbs they buy at the grocery store. Who knows what the variety is? And maybe the bulb was treated with something to keep it from sprouting. And maybe, if you didn't check closely, it came all the way from China. But I had some organic garlic from the grocery store that came from California so I decided to plant some of it to fill out the row. And to satisfy my curiosity about how well grocery store garlic would grow for me. After all, it is probably a soft-neck variety. It might not grow well, but then again, it might grow just fine. In either case, hopefully it will fill out the row. Symmetry restored. Of course, I labeled my shallot and garlic rows. Always label the varieties. You WILL forget. And then I planted them in alphabetic order. You never know what could happen to a wooden plant tag in the wintertime. A bunny could run off with it. It could get erased by snow and ice. Or it could just get picked up by the wind and tossed about. Yes, best to plant in alphabetical order if you can. Left to right as you stand and look west. That's the order I went alphabetically, in case anyone asks. And the grocery store garlic? I labeled it 'Grocery Store'. Now to wait until the end of June or thereabouts when the tops of the shallots and garlic begin to yellow and die back. Then I'll harvest, clean, and air dry my crops and begin perusing through some cookbooks to see what I should cook, Julie Child style. To borrow a phrase from Julia, "Bon Appetit"! Or shall I say "Bon Jardinage"! The grocery store garlic is most likely from Gilroy. They have a big festival every year and even have garlic ice cream. I live in Sacramento and the Gilroy festival is a really big deal. Maybe you can make some garlic ice cream when your crop ready. Sure 'nuf, just went & checked... my cooking garlic IS from China. Who knew? Roasted garlic, spread on French bread, is yummy. Enjoy! @gotthedirt - I would return that garlic from China to the store where you got it and get your money back! Buy organic if you can. I got my first garlic bulbs from a neighbor, known locally as the Garlic King. It is a German hardneck variety. When he crowned me Garlic Queen at our annual Heath Fair the crown was made of softneck garlic so this year I have planted hardneck and soft neck garlic beds, using my own best garlic bulbs, and three of the six softneck bulbs from my crown.Filaree Farm has many many garlic varieties and really good advice. I will begin my clean up today. Here's to many stinky heads of garlic in your future! It will be interesting to compare how your grocery store garlic progresses compared to your named varieties.